Christopher Reid’s Costa Book Awards winning collection of poems arrived today – ‘A Scattering’. 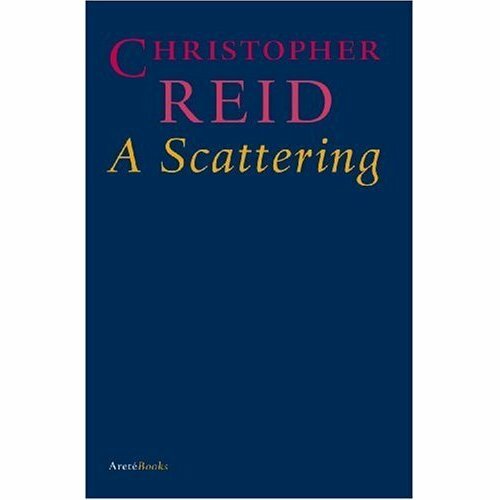 Costa Book Award Winning Poetry "A Scattering"
The surprise winner of the important £30,000 literary prize, and only the fourth poet to achieve the accolade, Reid joins the ranks of Ted Hughes, Douglas Dunn and Seamus Heaney. The choice was supported by ‘a substantial majority’ of the judges, according to novelist Josephine Hart, chair of the judging panel. It seems a fitting further tribute to Christopher Reid’s stunningly beautiful tribute to his wife Lucinda Gane, who died in October 2005. 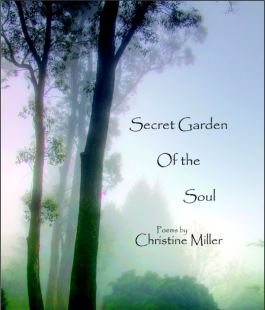 Christopher Reid has described this poetry as his way of surviving Lucinda’s final illness and his widower-hood. When I read a couple of extracts their intensity and emotion, delivered in a sparely evocative fashion, brought me to tears. You can see them here: Scribd. I found ‘Late’ especially powerful. It’s a real joy that poetry triumphed – hopefully indicative of the more general recognition which is starting to build of the power of poems to eloquently express our inner and outer worlds. I notice there is also a poetry event taking place in London this weekend at Central Hall Westminster, in support of Haiti, organised by Poet Laureate Carol Ann Duffy and Poetry Live – details here. A a rare treat for the soul for £10 and all for a good cause. See you there? 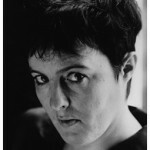 With Scottish poet Carol Ann Duffy appointed the first female Poet Laureate, it’s a step forward for beautiful, accessible, understandable poetry that appeals to a wide audience. That doesn’t mean Duffy’s poems are not exquisite, well constructed, masterly – simply that they are identifiable as expressions of universal experiences. Duffy wrote poems from a very early age, and attributes some of her success to the support she had from her mother who was herself a compelling storyteller, and teachers who encouraged her work to the point of typing up her early poems and posting them on the classroom wall. One test of whether a poem ‘worked’ was if her mother could understand it – if she had to ask for explanations, Duffy knew more clarity was required; she also puts the obscurity of so much poetry down to the fact that in many cases it was important that the poet’s wife couldn’t understand what was being said! 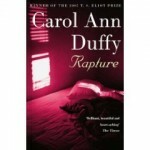 Duffy has won many prizes for her poetry, and her most recent collection, ‘Rapture’, which charts a love affair in the life she describes as ‘complicated’ , carried off the T.S. Eliot Prize in 2005 . I believe that her prize to our world will be to make poetry more accessible in schools, (her work is already on the GCSE syllabus) and in general. In many ways, like art and music, poetic writing is the closest we can get to expressing the essence of the soul, and it’s a therapeutic way of bringing our deepest thoughts and feelings forward into consciousness. 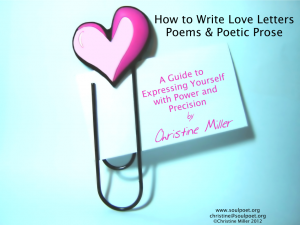 The power of poetic expression is undeniable, and universal, witnessed by the longevity and pervasive influence of such writing, ranging through many styles from for example Rumi, Shakespeare, Wordsworth and Eliot to Betjeman, Ted Hughes, Sylvia Plath, Adrian Henri… (I could go on…and on) and the disciplined minimalism of Haiku. Here’s a snippet from Carol Ann Duffy’s Rapture, a poem called ‘You’. like a tiger ready to kill; a flame’s fierce licks under the skin.